I think it must have been more than two decades ago that J.P. Creel, a relative, gave me some green onion sets. 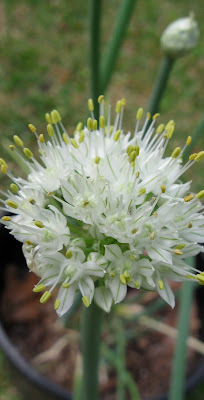 I love the green onion tops in salads, and I promptly installed them in a flowerpot. For a couple years I followed instructions. Once they bloomed, I would pull them up, let them dry then replant. One pot multiplied to two, supplying ingredients for our green salads throughout the year. One year, in the busyness of life, I just let them bloom without the usual replanting procedure. I regretted the thought of losing my little taste of freshly picked onions. That regret was short-lived. The hardy little bulbs, little because they multiplied and packed the container, came up. They have kept us in salad ingredients ever since, with only occasional watering and feeding on my part. I am now attempting to grow vegetables on a slightly larger scale than one pot. But through all those years the trusty little onions have provided an unremarkable but cherished routine. I start assembling our salads then hike out to the onion pot in our backyard, pinch off a few blades, look around our little spot of outdoors, take a deep breath, relax and head back inside to finish my part of meal preparation. Thank you J.P. for a gift that keeps on giving.